I decided to attend Quinte Mini Con about a week before the actual con. A couple of my cosplay friends, Tsuki no StarDust and SawakoMio had a free spot in their hotel so I joined them for the weekend. In the end I had so much fun and I am so happy that I attended! It is a pretty small con but the people are all so friendly and I got to hang out with cosplayers who are normally very busy at cons such as Detailled Illusion and Miss Messy Mia. I made new friends and strengthened my friendship with older friends. The first day of the con, Saturday, started out with a super early morning pool shoot in our hotel. StarDust and I took photos of each other's costumes by the pool and even in the water. 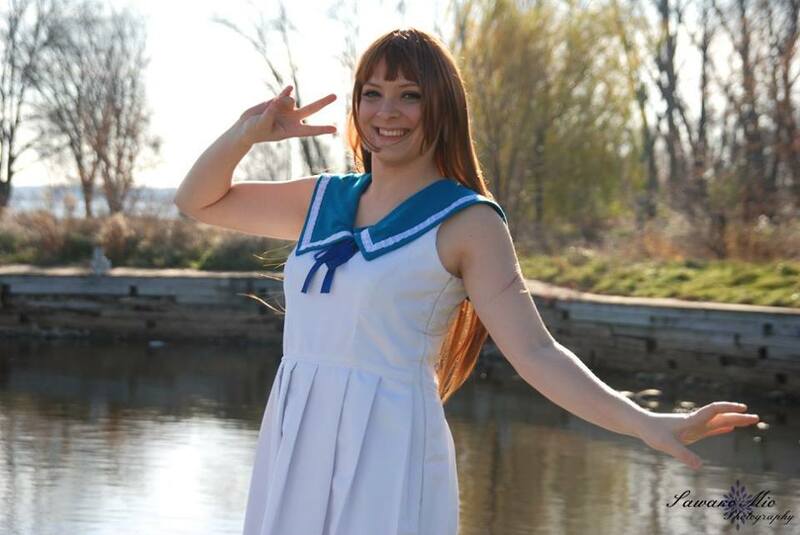 I was cosplaying as Manaka from Nagi no Asukara and StarDust was Haru from Free! It was a huge learning experience! Wigs would fall off, I would accidentally flashed StarDust (I was wearing booty shorts though so it was ok) and the actual pool was slightly cloudy which really affected the results of the photos. The rest of the day I wore my Maid Saber cosplay. I had a scheduled photo shoot with a photographer from Toronto and I participated in the masquerade that night. The majority of the day was spent chilling with friends and being silly. By the end of the day I was absolutely beat (being up since 5:30 am that morning) and I could hardly keep awake throughout dinner. We stayed up talking about future cosplans until I really could not stay awake anymore. Sunday started out with checking out of the hotel and going down to the harbour to snap some photos before heading to the con. The award ceremony was first on the con schedule for us and it resulted in me receiving my first official Master award (Best in Class)! StarDust and SawakoMio had performed together and they won Best in Show :D We left the con pretty late in the afternoon with lots of great memories. I definitely want to go back again next week!